We have teamed up with A Touch of Fun kids themed parties to bring something for the whole family. With an array of FUN themes such as, hunger games, army, mystical treasure hunt, Olympics, rugby, soccer, surf and more, your child and their friends will be kept busy and entertained by participating in team activities and games. 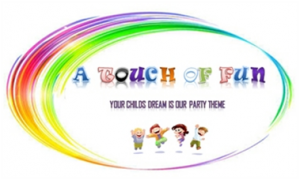 A touch of fun is your one Stop Shop for All Your kids party needs. They can do it all! All they need to know is, Where, When, How many and What You Need and Want. And they will take care of the rest. You can find out more about them by visiting their website. Fresh Garden Mixed Salad – (Mixed Green Leaves) Cherry Tomatoes, Cucumber, Spring Onion, Feta, Peas, Carrot Sticks, Green Peppers, Avocado with Vinaigrette Salad Dressing. CUTLERY AND CROCKERY NOT INCLUDED. VIEW MENU EXTRAS FOR ADDITIONAL FOODS, DRINKS, DESSERTS AND CUTLERY AND CROCKERY.